Cox & Kings product executive Jake Cook shares his favourite things to see and do whilst on a cultural holiday to Madagascar. Andasibe is “the place” to see the indri indri lemur, as well as up to ten other species. I had amazing sightings of different indri families fighting over territory and diademed sifakas playing in the trees. Mantadia is great for birds, frogs and insects. I was even lucky enough to see a tenrec (akin to a hedgehog but with different coloured spines) foraging during the day. Great night walks are also to be had in the nearby Mitsinjo forest, where chameleons and nocturnal lemur species are abundant. This national park has spectacular rock formations interspersed with canyons, riverine forests, waterfalls and natural springs. Landscape photographers and hikers will absolutely love it here. You can also find sifaka, brown and ring-tail lemurs amongst the spectacular sandstone rocks, which have been divided by deep canyons into extraordinary shapes. On paper this is a long full-day drive, but this was one of my favourite parts of the trip. First I passed through the town of Finarantsoa en-route to Ambalavao, the capital of Madagascar’s paper-making industry. The factory was far smaller than I imagined, with only a handful of workers. Everything is handmade and the short tour I took was fascinating. After lunch we stopped at the small Anja Reserve, a fantastic community owned and run eco-project. The guides were very friendly and will lead you along easy trails to see some of the 400 ring-tailed lemurs that live there. There were many stops for photos as the scenery changed from lush central highland views to dry flat grassy plains. Satrana Lodge in Isalo National Park is an excellent French-managed property that looks like a cross between a large alpine ski-chalet and a luxury safari-like tented camp. There is a friendly atmosphere with attentive staff, a large pool and attractive communal areas. The food is as good as any I have ever had and worthy of applause. Top tip: ask for one of the superior tents that are larger and have exclusive uninterrupted views of the Isalo massif. 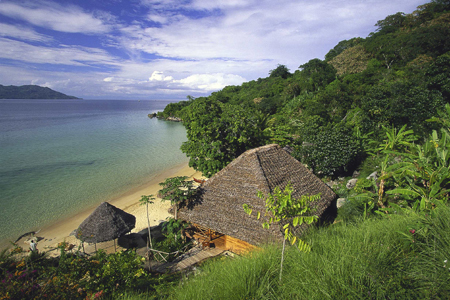 Nosy Komba is a beautiful island a few kilometres from Nosy Be, accessible only by boat. Well-known for its population of habituated black lemurs, this charming island has dramatic hills and sandy beaches. My favourite beach was at the Tsara Komba, a stunning lodge set on a steep hillside of bougainvillea, papaya and flame trees. Nature has completely embraced the lodge’s surroundings; beautiful hummingbirds fly around the place and the call of the black lemur can often be heard accompanied by tree frog. You can easily fill your days with snorkelling trips and island hopping. Or else, the island walks are fascinating, as is the market and perfume distillery. The restaurant and bar, perched on the hillside provides outstanding food, the focus being on seafood. It is also certainly worth trying as Tsara Komba’s famous coconut rum punch.